Having a barbecue with you is handy when you need a bit of extra cooking space and the campsite doesn’t allow bonfires (boooo). 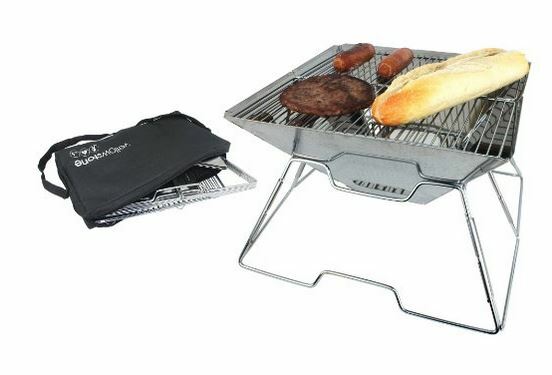 We hunted around for a while for a decent portable barbecue which folds up small enough to slip in a rucksack and doesn’t fall apart after two uses. Cost was another factor. We like cheap! For the price of a couple of disposable barbecues (which we don’t like as the coals are too close to the food) you really can’t go wrong. Now it’s not large enough to feed a family of six, but for one to two people it’ll do fine. We’ve used this as a mini-raised fire pit in the past to keep us warm at night (and to toast marshmallows on!). It’s also small enough to keep permanently in the boot of your car with a bag of charcoal. The dimensions when opened at 22cm x 31cm x 31cm ,Size closed: 31cm x 4.5cm x 20cm and it’s made from stainless steel. The steel won’t stay shiny after use, but we call that character. Use instant light charcoal bags for convenience. They’re a perfect size! Register to comment on articles and reviews.